Besides the Vegan and the Gluten-Free, What Else Do We Need to Consider? I made bean salad and asparagus vinaigrette too. 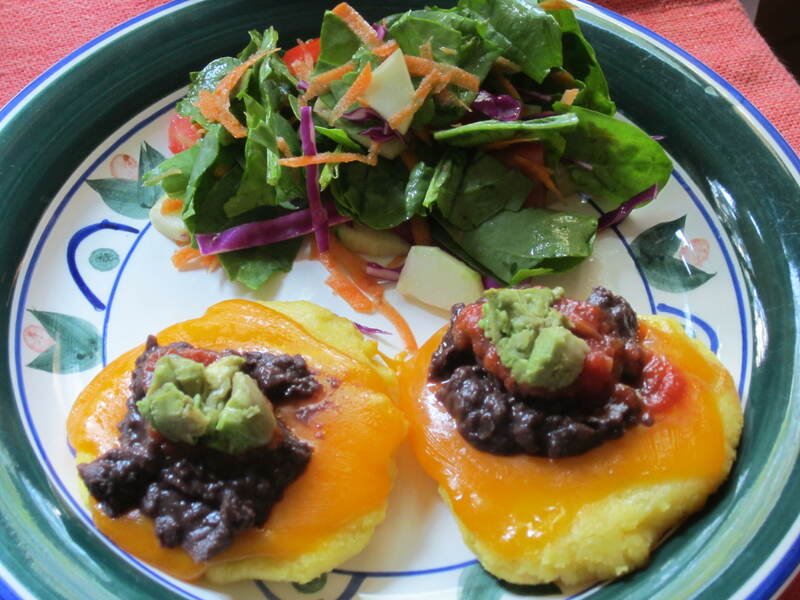 This evening it was “arepas.” This is something our Spanish teacher used to make with the class and they LOVED it. Basically, you use roughly equal amounts of Masarepa flour (cornmeal, but specially marked package) and water, with a little salt and oil. Knead it a bunch and make little cakes. Bake them on a griddle. Shown here both with and without cheese because my husband thought his looked just as cute. 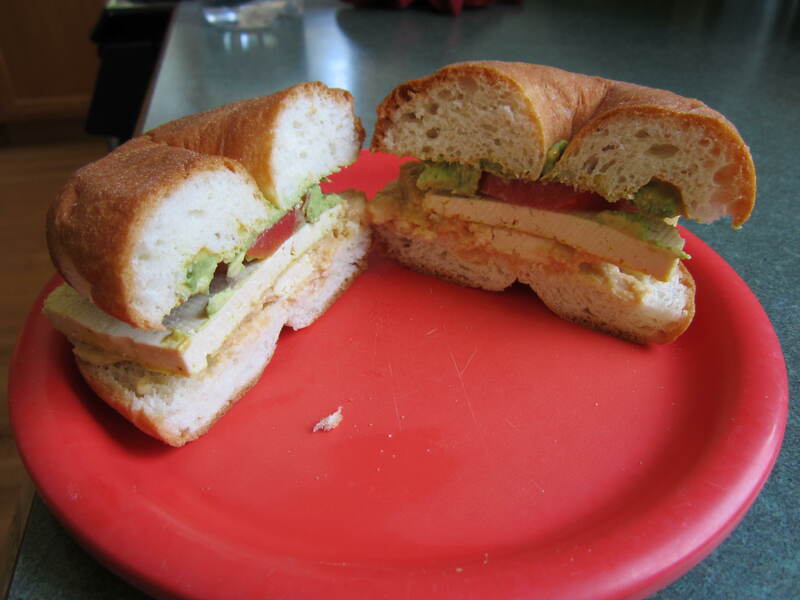 This is a sandwich made with my home-made hummus, baked tofu, and avocado and tomato on an Udi’s gluten-free bagel. Shoulda had a pickle. Speaking of Claudia, check out this AWESOME birthday present she gave me! Actually, it was in two parts. 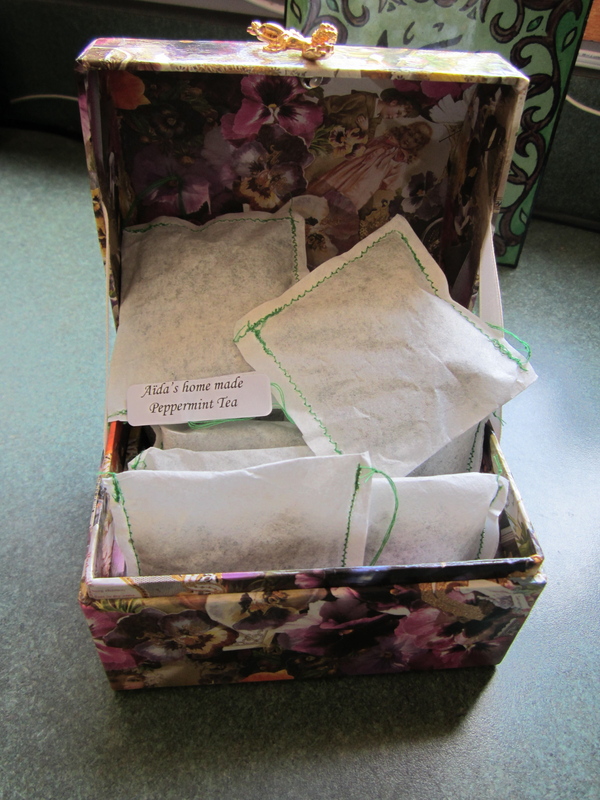 The first was locally grown peppermint tea, in hand-sewn teabags! 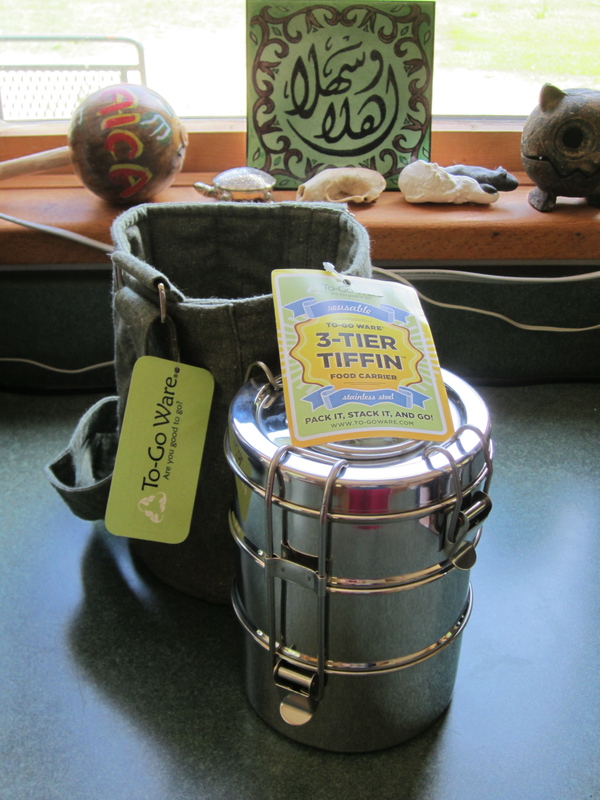 The second is something I’ve been coveting every time I see my students haul out their lunches at school – a stainless steel “tiffin” from To-Go Ware. Here shown with its own little insulating carry sack! Now I can’t wait for school to start up again. Um, that’s not completely true, but I CAN use it beforehand! Thanks, Claudia! 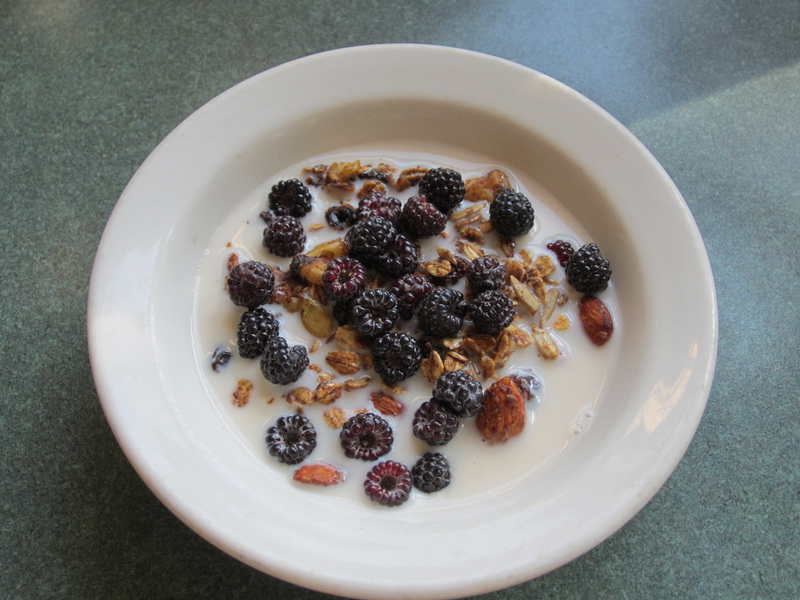 6 Responses to Besides the Vegan and the Gluten-Free, What Else Do We Need to Consider? Great! the food looks delicious. What are you going to do about gluten when you go up to the northern hinterlands? I’m supposed to be doing this for six weeks, which means I might try “only” eating vegan up there. Or if I don’t want to stop, I’ll probably just bring food with me. I’ve always wanted a tiffin set like that. Cool. 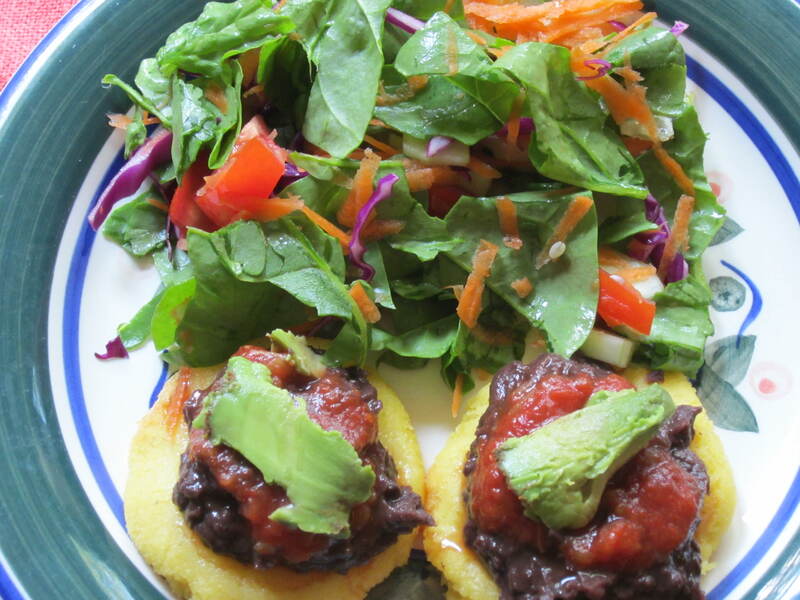 Your arepas look yummy — I’ve never made them but think I have a recipe so I should try it. 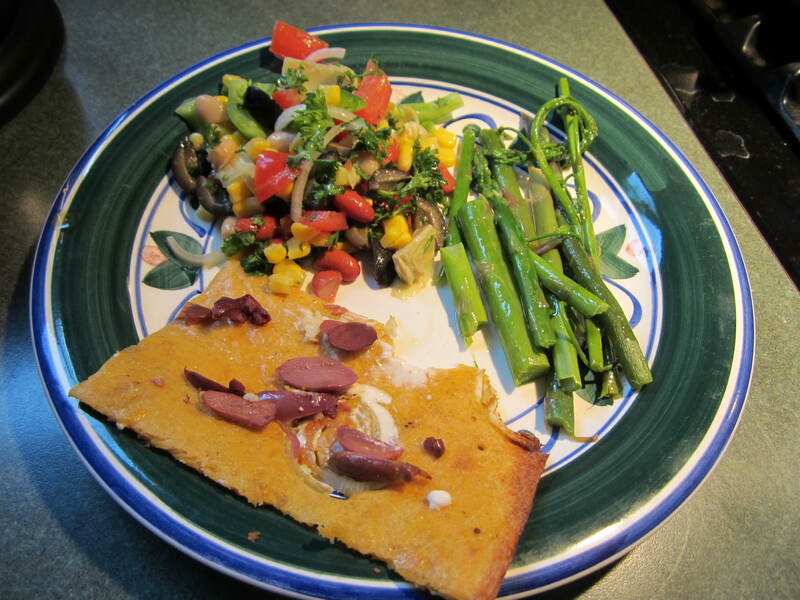 Chickpea bread (and quiche) is a favorite around here. I can never find Udi’s products that are vegan — they always have eggs and sometimes whey or honey. Did you find vegan bagels? I just tried some Mary’s double chocolate cookies and they tasted pretty good, which is to say, not bad, though I’d rather have her crackers and twigs. About gluten-free dining … I’m surprised at how many restaurants know how to make things GF if you ask. I’m finding GF menus in the most unexpected places. Yeah, those Udi’s bagels have eggs. I think they’re going to be a transition food…. when it’s not so hot I’m going to bake some bread here. My best baking has been from The Allergy Free Cook Bakes Bread. They may have it in the library. Thanks for the recommendation – the library does not have it, but I’ll look for it in the bookstore.